Thanh, tu as terminé THE TRACK, la course par étape et en autonomie alimentaire la plus longue du monde. Quelle a été ta première émotion en franchissant la ligne d’arrivée ? When I got to the last stage, I knew I should empty the tank and leave nothing left unused. So that’s what I did. 137km was the longest and the loneliest stage as I didn’t see many people or run it with anyone but it was my best stage. It was the only day I felt that I was confident making it to the finishing line. I was pretty much disoriented from the sleep deprivation before crossing the finishing line but when I knew I did it, it was an amazing feeling. I was relieved and in many ways, felt empowered that I had held onto that tiny hope that I’d make it all the way. Qu’est-ce qui fut le plus difficile pour toi pendant la course ? Un ultra marathon classique dure généralement 5 ou 6 jours. Que s’est-il passé pour toi après le 5ème jour de compétition ? Comment as-tu géré cette seconde partie de course ? You really have to just focus on the day itself. As soon as you finish the day, forget about it. Don’t think about how it could have or should have gone. 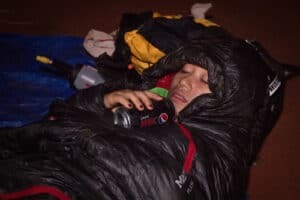 Get on with your recovery and prepare for the next day. With this length and duration, you must move on quickly. No dwelling on anything. Do whatever you got to do and get on with the race. La dernière étape est une compétition dans la compétition. Il s’agit d’une étape de 137 km. Comment étais-tu avant le départ de celle-ci ? I was actually quite pleased to get to the last stage (despite the early 4am start). It was when I knew I’d make it to the finishing line of the entire race no matter what. I could almost say I was excited for it. Tu es la première femme asiatique à être Finisher de THE TRACK. Est-ce important pour toi ? Yes, I think being the first is a great beginning. When people see that it can be done, they will try and that’s how progress is made. There will be more strong Asian female who can do these races much faster and stronger. Quel est ton meilleur souvenir de THE TRACK ? Running in the dark on the last stage. Feeling the drag of the arduous 8 days before and the lack of sleep, I was pretty drained. But as I looked at the magnificent sunset and the majestic Mt. McConner, I felt grateful for being able to be there. I felt such revival of energy in me and all of a sudden, I really could ran. 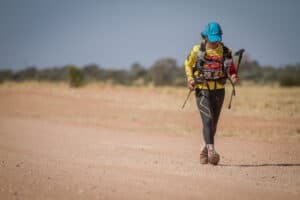 Un mot pour décrire cet ultra marathon ?